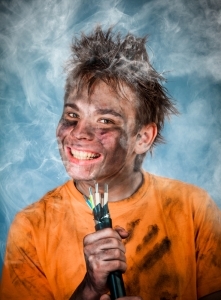 Mess with electricity and you could end up like this guy…. Faulty electrical wiring and poor judgement by people when using electricity in a household is a major cause of fire and shock related deaths and injuries. There are about 40,000 residential fires annually which are claiming more than 350 lives, causing thousands of injuires from electric shocks and burns, and resulting in more than $2 billion in personal property damage. Your body is a good conductor of electricity. Fortunately, your skin is a good insulator and it is not easy for current to flow through you. Unfortunately high voltages (50 volts and up)can push current so hard that it punctures your skin and begins to flow through you. Water and electricity do not mix very well. That is why you should have GFCI’s placed in areas where water and dampness are located. Plugging in or touching an electrical device with one hand in water is not a good idea. Just check out the low values of current that can cause a shock. Electric current will flow through both arms, through an arm or leg to ground, or through any body surface to ground. There is a certain current level at which an individual cannot voluntarily release from the circuit. This is the “cant let go current” from which burns and death by electrocution can result. Electrical shock begins when the current through the affected parts of the body is about 0.002 amperes. When the current increases to about 0.015 to 0.020 amperes, it becomes impossible to let go of the circuit. At higher values of current, above 0.100 amperes, heart stoppage will occur and cause almost certain death. Electrical circuits of 120V can kill just as fast as 240V, 480V, because the current flow through the body is dependent on the skin and body’s resistance. Electrical shock can also cause quick movements which may result in other injuries. 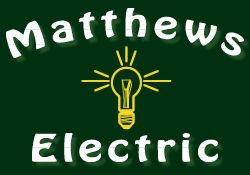 If you have an electrical problem, call an electrician. Better to be safe than sorry. These are a few precautions you can take when using electricity. These units could be one of the major causes of fire in a home and should be avoided if possible. If you have to use these heaters to keep from freezing please, do not leave these units on when you leave your home. Do not place these units next to combustable materials (drapes, curtains etc.). Do not use a heater rated higher than the circuit it is plugged into. A 2,400 watt heater would draw 20 amps. It would be a fire hazard to plug this unit into a 15 amp circuit. This could overheat the receptacle and circuit wiring before tripping the breaker. Another major cause of fires in the home are extension cords and cords connected to appliances and tools. Extension cords should be used only as a temporary wiring method. Instead of using a cord for a permanent wiring method add more outlets. Most extension cords will not carry as much current as the normal house circuit without overheating. Check all cords for frayed or cracked insulation or damaged plugs. Make sure they are placed out of areas where they will get excessive wear such as under carpets or in doorways. Do not use an appliance or tool that uses more amperage than the cord is rated for. Do not use indoor cords outside. All outside cords should be plugged into a GFCI. protected outlet. Use only UL approved cords. When removing a cord from an outlet, grasp the plug. Do not pull on the cord. Please read the definition of a fire stop before you drill holes or put notches in these safety devices. Firestops are more correctly called through penetration firestops. A through penetration is created when a cable, conduit, or pipe passes through an opening in a fire-rated wall or floor. The opening offers a path for fire and smoke to spread. A firestop is a special seal designed and tested to restore the fire integrity of the barrier. When replacing incandescent bulbs do not exceed the socket rating of the fixture. These bulbs throw off enough heat without exceeding there rating. The best bulb on the market today is the CFL (Compact Fluorescent Lights). These bulbs fit into a regular lamp socket and throw less heat and give off better light than incandescent bulbs. These bulbs may cost 7 to 15 dollars, but will last about 10,000 hours. Newer light fixtures require that the temperature rating of the wire feeding these fixtures be at least 90 degrees C. This is the temperature rating for these light fixtures. It’s important that the temperature rating for the wiring feeding these fixtures match or exceed the rating for the fixture. If the temperature rating of the wiring is lower than the 90 degrees C. required, the insulation around it becomes brittle and may break away. This allows arcing between bare wires, which causes heat that melts the fixture and could be a fire hazard. Click Here For more information on lights. Watch for flickering lights, sparks from appliances, switches or wall outlets, circuits that do not work, and switch plates and wall outlets that are warm to the touch. If any of these conditions are found, you should have them repaired immediately. Make sure children stay away from electrical outlets. Insert blank plastic plugs in unused outlets, especially if there are children in the house. Check for outlets that have loose-fitting plugs, which can overheat and cause a fire. Replace any broken wall plates. Don’t overload wiring circuits by using 6 and 8 plug cords or adapters. If you are using three-prong plugs in a room with two-conductor outlets, do not cut off the ground pin from the plug; this is an electrical shock hazard. Be careful if you use a heating pad or electric blanket. Sleeping with a heating pad turned on can cause serious burns even at relatively low settings, and tucking in the sides or placing another blanket on top of your electric blanket can build up enough heat to start a fire. Have a licensed electrician install Ground Fault Circuit Interrupters (GFCI) outdoors, in bathrooms, kitchens, or in any location where electrical appliances or products come in contact with water. Nearly all electrocutions involving consumer products could be prevented by using GFCIs. GFCIs are used in most areas where there is a chance of electrical shock from persons or electrical devices coming in contact with water. These devices should have a UL label and be properly installed by a qualified electrician to have the amount of protection they where designed to give. GFCIs should be tested at least once every month to be sure they are working properly. The instructions direct that when you press the test button the reset should pop up. Beware though, this test is not always accurate. To be sure, plug a light into the GFCI receptacle. The light should be on. When you press the test button the light should go out. When you press the reset the light should go on. Many homes built prior to 1950 have a type of electrical wiring known as knob and tube. This system consists or two wires, one hot wire and the other neutral to create a circuit. These two single wires are held in place with ceramic knobs and tubes. Knobs are used to clamp the wire to the structural member, while tubes are placed in holes in the structural members to prevent the wire from chafing. Still considered a wiring method there are some concerns with knob and tube. There is no ground wire. The insulation around the knob & tube wiring breaks down over time. Often it is hard to tell which is the live wire and which is the neutral making it hard to polarize outlets. Some insurance companies are refusing to provide home owners insurance on homes with knob and tube. While knob and tube wiring is not considered dangerous by some, you should have an electrician check the condition and amperage capacity of the knob and tube in your home. Most everyone saw the movie Christmas Vacation and felt happy when the Christmas lights went on. Unfortunatley this was just a movie and there is no way that many lights would have worked on a regular convenience outlet. If you are going to install a large number of lights on your house, you should have them on a dedicated circuit or circuits. The total amperage load should not exceed 80 percent of the amperage rating of the circuit. Example..If you have 1,200 watts of lights at 120 volts this would be 10 amps. Watts = Amps x Volts. Overloading a circuit could be a safety hazard and should be taken seriously. Keep electrical connectors protected from the wet snow or rain. Moisture can cause a short. If a bulb has burned out, keep it in its socket until a replacement can be made. Plug the lights into a ground-fault circuit interrupter (GFCI) receptacle. Follow the manufacturer’s guidelines for the number of light strands that can be daisy chained together, usually, three. Before you try electrical work on your own just think of the safety precautions and electrical training an electrician must learn and have before he or she can become licensed or certified. He or she must learn the safety regulations put forth in a book called the National Electric Code. This book has thousands of safety precautions that a person not in the trade would not even consider. He also must have thousands of hours in the trade. Do not take electricity lightly. There is a reason it takes so much training. Yes the electrician is well compensated, but what price do you put on your home and the people in it. It is a violation of board regulations for a licensed electrician or systems technician to connect wiring from components that have been wired by an unlicensed person. Check for outlets that have loose-fitting plugs, which can overheat and lead to fire. Replace any missing or broken wall plates. Make sure there are safety covers on all unused outlets that are accessible to children. Make sure cords are in good condition—not frayed or cracked. Make sure they are placed out of traffic areas. Cords should never be nailed or stapled to the wall, baseboard or to another object. Do not place cords under carpets or rugs or rest any furniture on them. Check to see that cords are not overloaded. Additionally, extension cords should only be used on a temporary basis; they are not intended as permanent household wiring. Make sure extension cords have safety closures to help prevent young children from shock hazards and mouth burn injuries. Make sure your plugs fit your outlets. Never remove the ground pin (the third prong) to make a three-prong fit a two-conductor outlet; this could lead to an electrical shock. NEVER FORCE A PLUG INTO AN OUTLET IF IT DOESN’T FIT. Plugs should fit securely into outlets. Avoid overloading outlets with too many appliances. GFCIs can help prevent electrocution. They should be used in any area where water and electricity may come into contact. When a GFCI senses current leakage in an electrical circuit, it assumes a ground fault has occurred. It then interrupts power fast enough to help prevent serious injury from electrical shock. Test GFCIs according to the manufacturer’s instructions monthly and after major electrical storms to make sure they are working properly. Replace all GFCIs that are not working properly, but never replace a GFCI with a standard non-GFCI outlet or circuit breaker. Do not use an appliance or device that trips a GFCI on a non-GFCI-protected circuit; instead, take the appliance to authorized repair center to be checked for faulty wiring or replace it. Check the wattage of all bulbs in light fixtures to make sure they are the correct wattage for the size of the fixture. Replace bulbs that have higher wattage than recommended; if you don’t know the correct wattage, check with the manufacturer of the fixture. Make sure bulbs are screwed in securely; loose bulbs may overheat. Circuit breakers and fuses should be the correct size current rating for their circuit. If you do not know the correct size, have an electrician identify and label the size to be used. Custom Electric offers Panel Labeling. Always replace a fuse with the correctly specified size fuse. If your home is still using fuses call Custom Electric for a FREE local estimate to upgrade your wiring service. And for those hard to find – older style breakers… We have numerous suppliers to help us provide the circuit breakers you need for your existing service. Don’t leave plugged-in appliances where they might fall in contact with water. If a plugged-in appliance falls into water, NEVER reach in to pull it out—even if it’s turned off. First turn off the power source at the panel board and then unplug the appliance. If you have an appliance that has gotten wet, don’t use it until it has been checked by a qualified repair person. If an appliance repeatedly blows a fuse, trips a circuit breaker or if it has given you a shock, unplug it and have it repaired or replaced. Check to see that the equipment is in good condition and working properly. Look for cracks or damage in wiring, plugs and connectors. Use a surge protector bearing the seal of a nationally recognized certification agency. Electric-powered mowers and other electric tools should not be used in the rain, on wet grass or in wet conditions. All outdoor electrical equipment should be run from a Ground Fault Interrupt Circuit (see above) to prevent electrical shock. Inspect power tools and electric lawn mowers before each use for frayed power cords, broken plugs and cracked or broken housings. If any part is damaged, stop using it immediately. Repair it or replace it. Always use an extension cord marked for outdoor use and rated for the power needs of your tools. Remember to unplug all portable power tools when not in use. When using ladders, watch out for overhead wires and power lines. When using ladders, avoid contact with overhead wires and power lines. Stay at least 10 feet from all lines. During an electrical storm, do not use appliances (i.e., hairdryers, toasters and radios) or telephones (except in an emergency); do not take a bath or shower; keep batteries on hand for flashlights and radios in case of a power outage (we sell and install Automatic Home Standby Generators); and use surge protectors on electronic devices, appliances, phones, fax machines and modems. Space heaters are meant to supply supplemental heat. Keep space heaters at least 3 ft. away from any combustible materials such as bedding, clothing, draperies, furniture and rugs. Don’t use in rooms where children are unsupervised and remember to turn off and unplug when not in use. Do not use space heaters with extension cords; plug directly into an outlet on a relatively unburdened circuit. Halogen floor lamps operate at much higher temperatures than a standard incandescent light bulb. Never place a halogen floor lamp where it could come in contact with draperies, clothing or other combustible materials. Be sure to turn the lamp off whenever you leave the room for an extended period of time and never use torchiere lamps in children’s bedrooms or playrooms. Consider using cooler fluorescent floor lamps. Never work on or around “hot” lines. Always de-energize lines and equipment by disconnecting from the power source at the circuit breakers or fuses. Don’t forget to test every conductor before you make contact with it. Never use the ground wire as the neutral or circuit-carrying conductor. The ground wire is not designed to carry current continuously, but briefly under an abnormal condition. The neutral wire is designed as a current carrier and can carry as much current as the hot wire. Use a strip gauge on devices to strip the proper length of insulation from wires. Too little risks the screw tightening on plastic insulation; too much leaves bare wires that can cause a dangerous contact. When using wire connectors, be sure the insulation on the wires is completely covered by the wire connector.